Ultra Fudgey Chocolate Mint Andes Brownies topped with a thick layer of Peppermint Buttercream Frosting. Perfect for St Patrick’s Day! 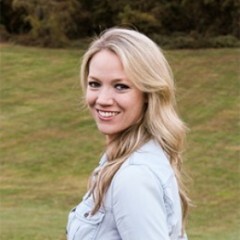 With St. Patrick’s Day over a week away I thought I’d share with you one of my favorite ways to celebrate the holiday. With dessert of course. Ultra rich and fudgey chocolate brownies topped with a thick layer of Peppermint Buttercream frosting. Does it get any better than that? 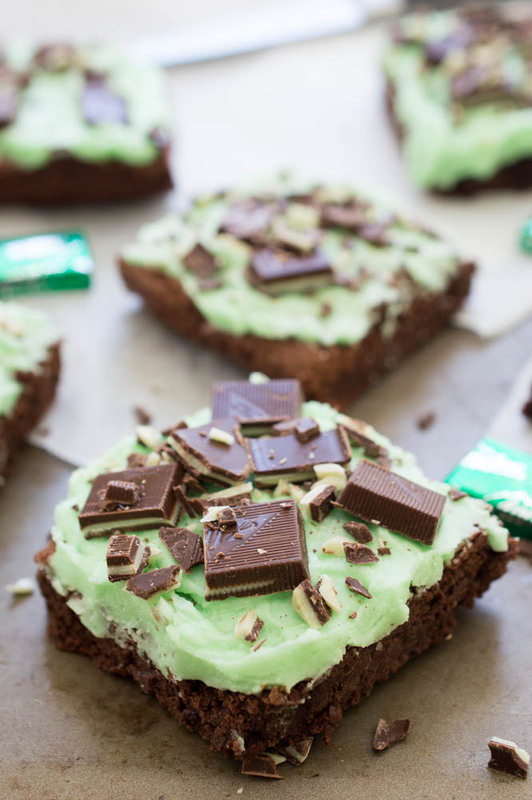 These brownies taste just like an Andes chocolate candy or a Girl Scout Thin Mint cookie. 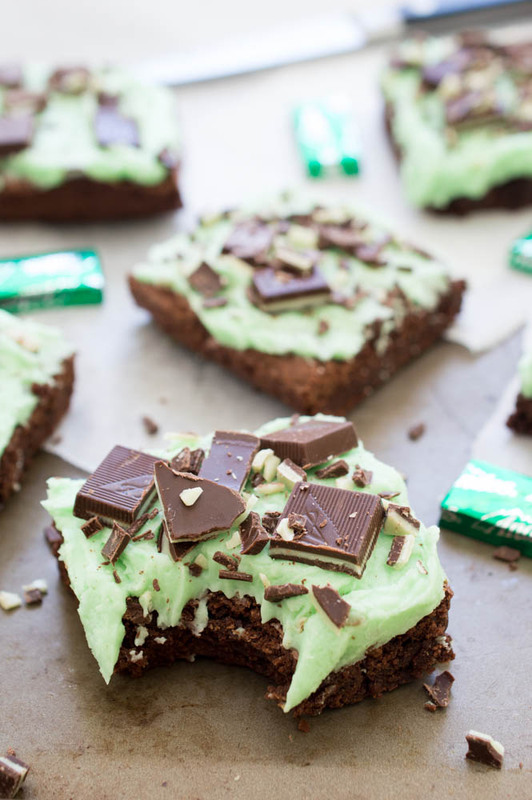 Peppermint and chocolate make the perfect combination. Let’s talk about the base of this dessert which is the brownie. I like my brownies chewy and fugdey. To achieve that I used as little flour as possible and added lot’s of chocolate. The Peppermint Buttercream Frosting has just a hint of peppermint and is not too overpowering. You can control how much peppermint flavoring you want in your frosting by adding a little more or using less extract. Peppermint extract can be potent so add only a little at a time. I used less flour for a fudgier brownie. 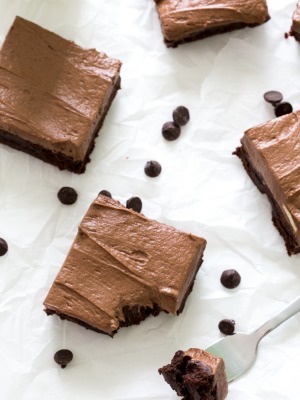 Chocolate chips and cocoa powder were used for an ultra chocolaty brownie. Brown sugar was added for extra sweetness and to give the brownie extra moisture. 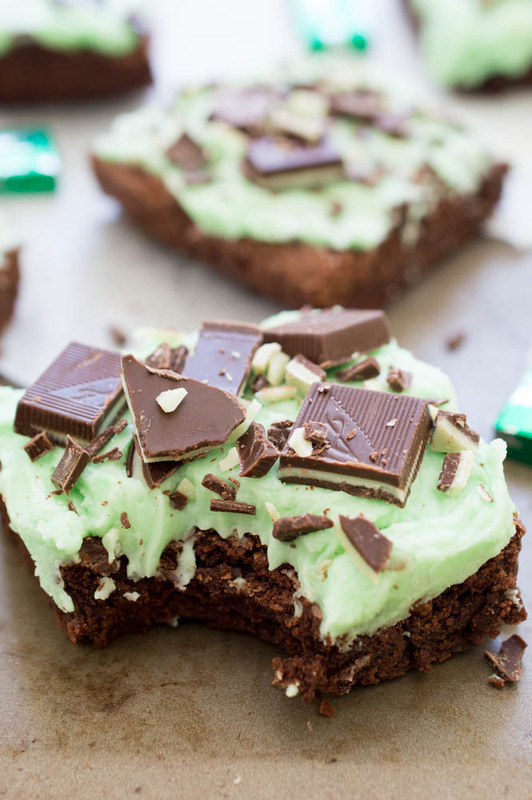 Celebrate St Patty’s Day with this decadent Chocolate Mint Andes Brownies! 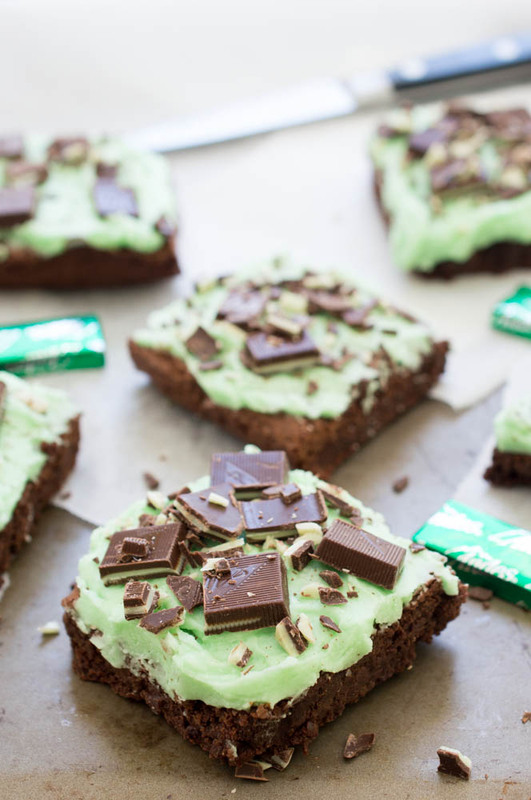 Ultra Fudgey Chocolate Mint Andes Brownies topped with a thick layer of Peppermint Buttercream Frosting. Perfect for St Patrick's Day! Line a 9 x 9 or 8 x 8 pan with aluminum foil. Lightly spray with cooking spray or grease with butter. In a large bowl add flour, cocoa powder and salt. 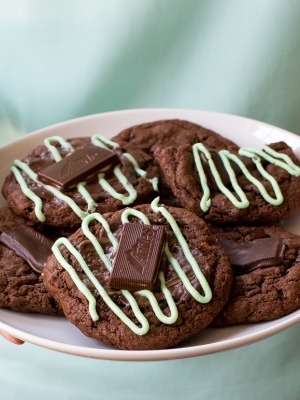 Top with Andes chocolate candies if desired. Add in powdered sugar, milk and peppermint extract. Beat until thick and creamy. If frosting is too thick add more milk. If it is too runny add more powdered sugar. Add in green food coloring. You can always adjust to your liking. Set aside until ready to frost brownies. All my favorite ingredients in once place! This looks amazing. Throw in a Guinness and it’s a meal! These look absolutely mouthwatering! YUM!!!! 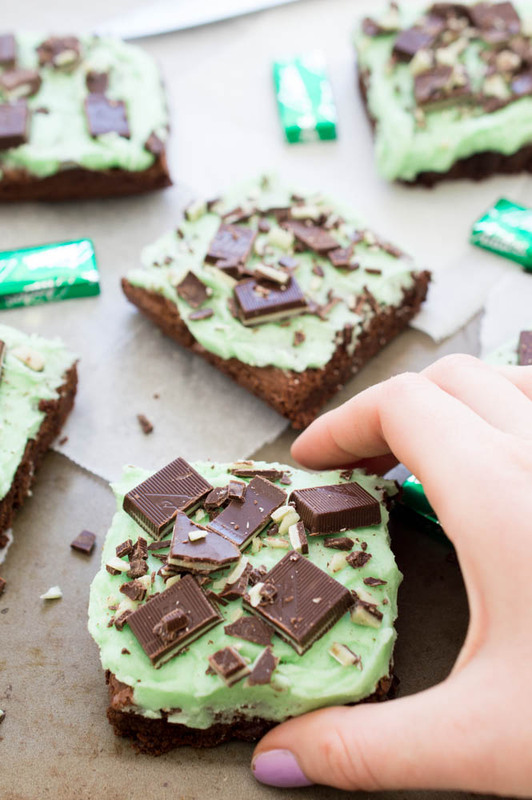 I saw the Andes mint pieces at the grocery store last week… I may just have to buy them and give this a try! Thanks for sharing! Oh goodness, these just sound amazing right now. I always love when restaurants give you Andes mints with the check! I’d love having a whole bunch of them on top of this yummy brownie. made ’em and loved ’em! Thanks!! So glad to hear you enjoyed them Alia! Thank you! Hi! Do you think i could double the recipe for a 9X13? Or would it be better to do batches as written? Thank you!! To do “two” batches, I meant! Yes if you double it should fit in a 9 x 13. Thanks very much! I’ll let you know how it works. Do you use the 1 1/2 cups chocolate chips to melt, and the 1/2 to fold in? Will Splenda work for the white sugar and Splenda Brown for the brown sugar? I have not tried baking with splenda before but if they are meant for baking then they should be fine in this recipe. Nope there is no leavener in this recipe.